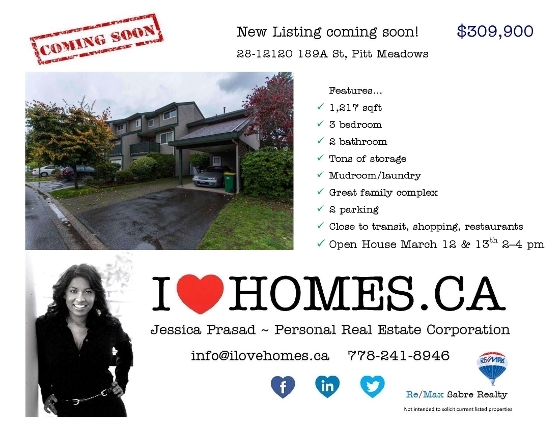 Come by the Open House March 12 & 13th 2–4 pm!!! Enjoy this well maintained and renovated, 3 bed, 2 bath END UNIT townhome in great family oriented complex! Upgrades include newer roof, windows and furnace/hot water tank, all the majors are taken care of! The split level open floor-plan has newer flooring, lots of light, south facing fenced back yard, great for BBQ's, pets and small children, it's a perfect home for a young family! 2 parking spots, large laundry/mud room, tons of closets and huge 5 ft crawl space. Close to schools, shopping, library, rec center, park 1 block away, transit and west coast express are walking distance, easy access to highway. Come to the Open House March 12 & 13th 2–4 pm!